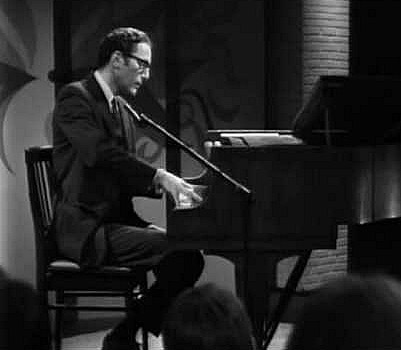 Tom Lehrer in 1959, probably performing ‘The Elements’ song. Source: krohsnest.net. Before we start learning more about the myriad ways people have tried to make the chemical elements in the periodic table accessible, I’d like to note that it would make life easier if that’s what people made an effort to call them – the chemical elements. Specifically these are the substances that cannot be separated into simpler substances by ordinary chemical methods and that are distinguished by their atomic number. As it happens, the word ‘chemical’ is often dropped off, leaving us with two quite different versions of ‘the elements’ – the chemical ones in the periodic table and the ‘intuitive’ elements this blog focuses on (earth, wind, water, fire, ether, metal, wood and consciousness). Both groups of elements have been called the building blocks of life and described as the substances that constitute all physical matter. No wonder people can get confused! So what actually is the periodic table some readers may ask. It is the system, created in 1869 by the Russian chemist Mendeleev, for organizing the chemical elements. A system that is still in use today. Commonly called the ‘Periodic Table of the Elements’ Mendeleev classified the 63 chemical elements known to science at the time by placing in the order of increasing atomic weight (now known as relative atomic mass). His organisational chart, based on rows and columns, was able to predict and accommodate new discoveries. This was fortunate as the most recent periodic table (2013) that I could find released by the International Union of Pure and Applied Chemistry had 116 chemical elements. Even more recent tables from other sources have 118. Some of these newly identified chemical elements have been synthetically created and/or are highly unstable. This modern version of the periodic table is based on the pioneering work of Mendeleev in 1869 and beyond. 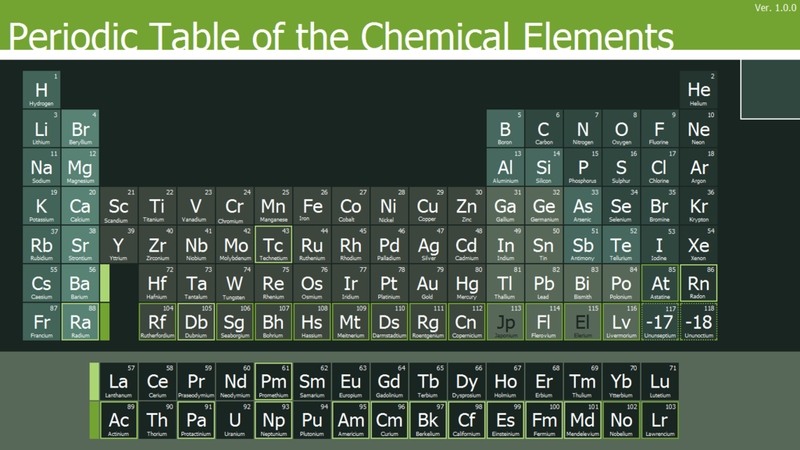 This is one of the very few tables that specifically refer to the chemical elements, of which there are 118 illustrated. Source: fc09.deviantart.net. Mendeleev’s contribution to science and discovery was significant, particularly through the creation of the periodic table. Those who have studied chemistry, as I have, know however the challenges involved in trying to learn the chemical elements classified in the table. Tom Lehrer’s 1959 song was an early attempt to make them more accessible and memorable. While the chemical elements are not in the order that they appear in the periodic table, the song is certainly catchy. And it certainly seems to have raised the profile of the chemical elements, with the song appearing in a number of different guises. With the advent of the internet, ways to provide a more interactive experience with the chemical elements expanded. 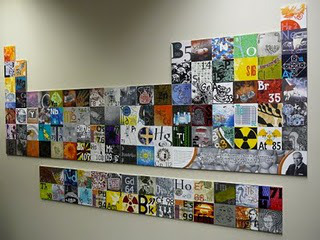 One of the earlier participatory versions of the periodic table can be found at chemicalelements.com. This site was started in 1996 as a school science project and has been developed and added to since then. A number of other interactive periodic tables are now available including the one developed by the Royal Society of Chemistry (rsc.org). The next major leap in popularising the chemical elements came with the release of the iPad. The name Theodore Gray immediately springs to mind. Starting in March 2010 with the release of an App called ‘The Elements’, there are now three related Apps called ‘The Elements in Action’, ‘Molecules’ and ‘The Elements Flashcards’. 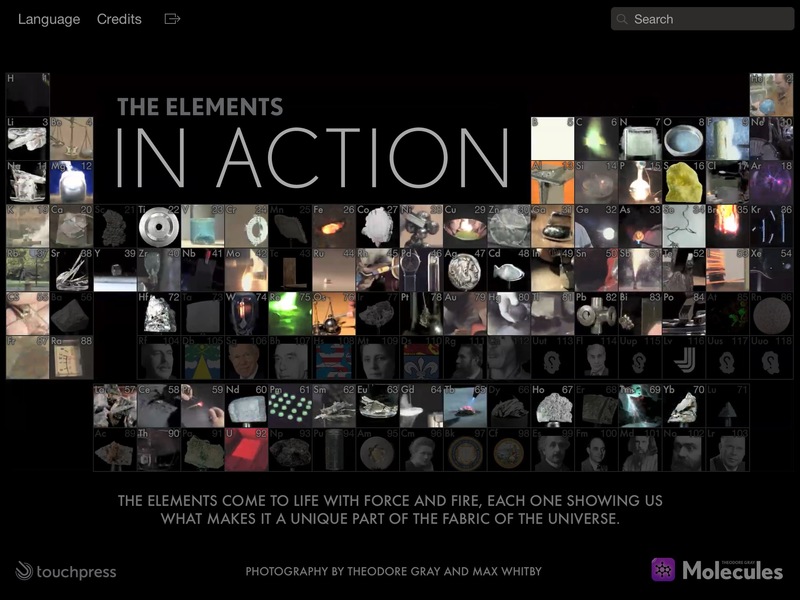 Stephen Fry is quoted as saying ‘The Elements’ is the “Best App of all…Everything is animated and gorgeous. Alone worth the price of an iPad.” Wired magazine states that the App was “proof that a tablet can transform staid subject matter – in this case, the periodic table – into rich interactive experiences.” High praise indeed. While the Apps are expensive as far as most Apps go ($24.99 USD for a bundle of the first three Apps listed above), if you are keen to learn about the chemical elements then they are hard to go past. The Apps also provide some pointers about how the intuitive elements could be portrayed interactively. ‘The Elements’ App by Theodore Gray. First released in March 2010. When you click on the ‘Song’ tab, ‘The Elements’ by Tom Lehrer’s song is available in English or Japanese. ‘The Elements in Action’ App by Theodore Gray provides an even more dynamic environment to learn about the chemical elements. 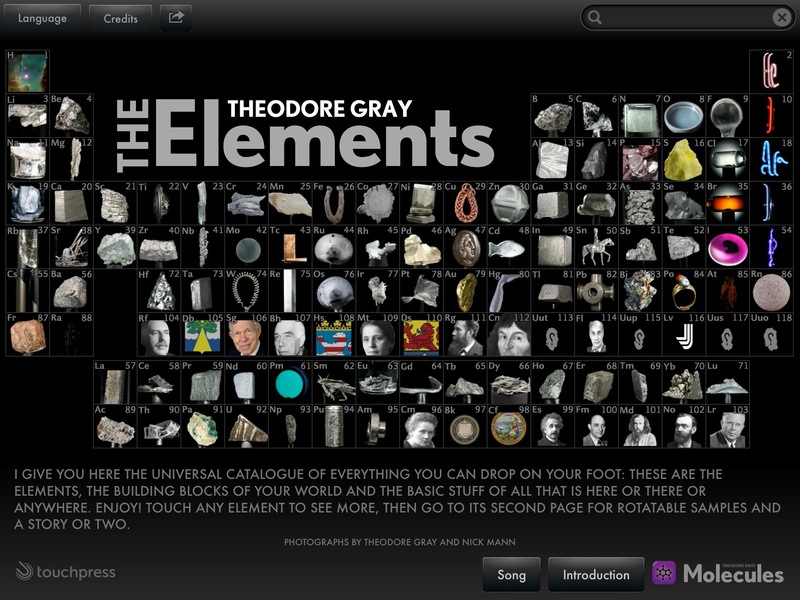 It is of interest that the description of ‘The Elements’ App on the Theodore Gray website calls it “the original and most in-depth app about the chemical elements.” I wonder then why the App itself was not called ‘The Chemical Elements”. Possibly because it would not appeal to as many people. ‘The Elements’ does have a softer tone to it and I believe taps into our hard-wired connection to the intuitive elements. If you get as far as downloading ‘The Elements’ App by Theodore Gray you will find a link to Tom Lehrer’s ‘The Elements’ song on the home page. Still popular 56 years on, Tom’s song has been given a new lease of life by the App, helped by its rendition in Japanese by two young girls. Due to the popularity of ‘The Elements’ App in Japan, Japanese is the only language the song has been translated into. It is sung in English for all the other languages on the App. Perhaps the book ‘Wonderful Life with the Elements’, written by Bunpei Yorifuji, set the scene in Japan for the Theodore Gray App. Published in Japanese in 2009 it personifies the chemical elements in the periodic table. Since 2012 the book has been available in English. It is broken up into five main sections that try to make the chemical elements relevant to everyday life. Richly illustrated, the main themes include ‘Elements in the living room’, ‘How to eat the elements’, and ‘The elements crisis.’ The last section poses the question that maybe we need to start examining our environmental problems at the (chemical) element level as well. I couldn’t agree more, as long as the intuitive elements are included. 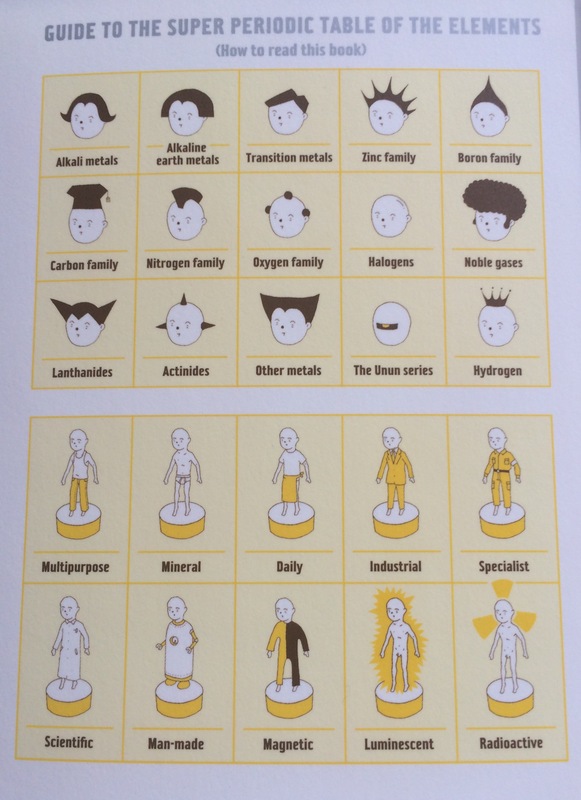 An image of the front inside cover of ‘The Wonderful Life of Elements‘, published in Japanese in 2009 and English in 2012. The diagrams provide a guide on how to read the book and illustrates the personalisation of the chemical elements. 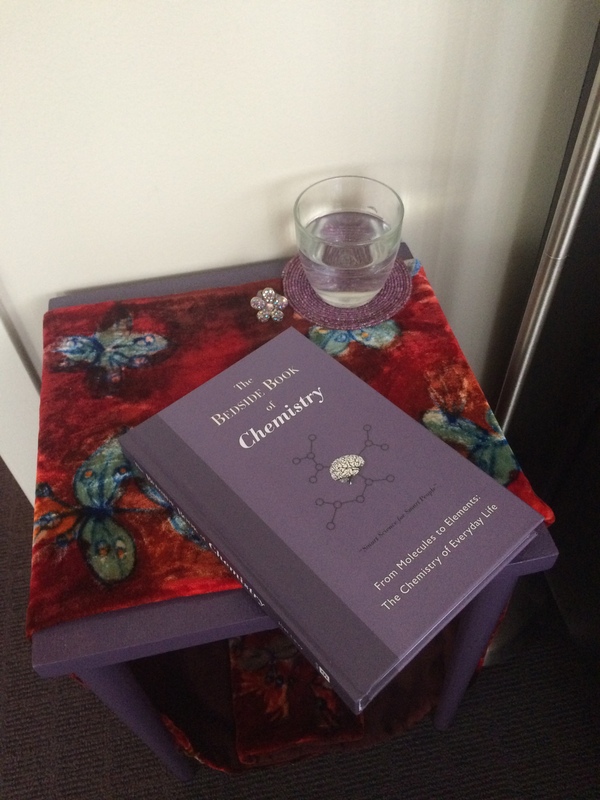 Another book that makes particular reference to the periodic table is ‘The Bedside Book of Chemistry’ published in 2011. Like the personified periodic table above, the book aims to introduce the chemistry of everyday life. Unlike the Japanese book and the Theodore Gray Apps, the bedside book is mainly text-based. It includes an overarching history of the elements (both intuitive and chemical) and introduces the key people involved, with a not so surprising emphasis on the claimed supremacy of western science. Keeping this in mind, the book is a useful reference as it is unusual to find this breadth of information in the one relatively accessible source. The authors may be optimistic thinking that people would keep this book by their bedside. The level of detail it captures makes it likely to appeal to a niche audience, such as the creator of this blog. If Apps and books aren’t your thing, perhaps art is. Various organisations have used art to try and bring the chemical elements to life. One such project was conducted by the Royal Australian Chemical Institute (RACI) during the International Year of Chemistry (which was in 2011 in case it passed you by). Printmakers and chemists worked together to create a separate image for 112 chemical elements, with each artist randomly allocated three to interpret. The final result can be seen on the RACI web site. More recently Yale University in Connecticut, USA held an exhibition on ‘The Periodic Table in the Twentieth Century’. Closing at the end of 2014, the display documented the development of the periodic table over 150 years and the incorporation of its components into graphic design. Mendeleev’s legacy lives on in a multitude of ways. It is likely that the chemical elements will continue to be referred to as ‘the elements’ when they are being popularised. As they are uniquely defined by their chemical position in the periodic table, calling them the chemical elements would accurately reflect their status and reduce confusion with the more diffuse intuitive elements. Until that happens, when I say to people that I am exploring the elements, I will continue to have to make it clear which ones I mean. Since writing this post in May 2015 I have found some more examples of the periodic table being popularised. Here they are! 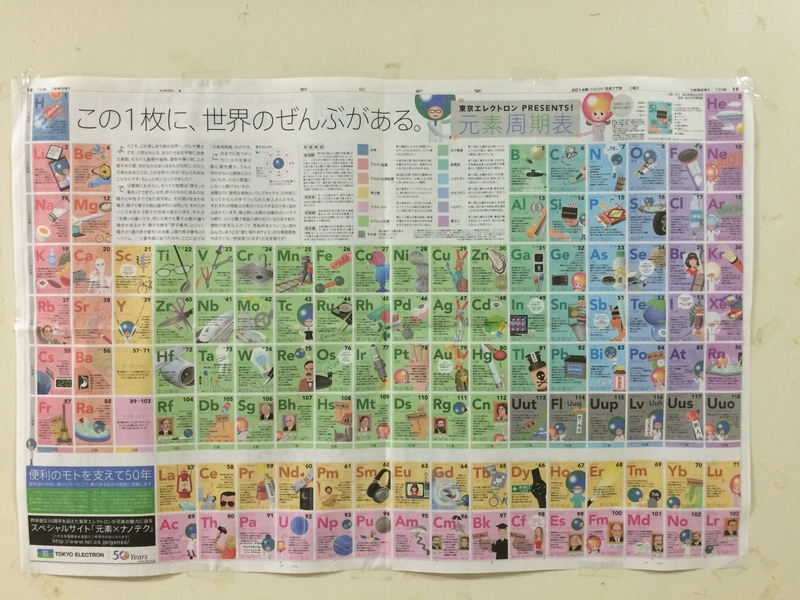 This version of the periodic table was seen at a Secondary College in Tsu, Japan in June 2015. It uses popular every day items to help students learn the different chemical elements. 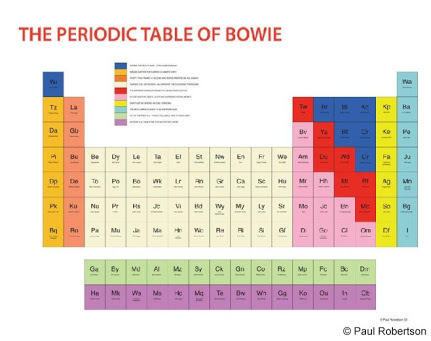 ‘The Periodic Table of Bowie’, seen at the fabulous exhibition ‘Bowie Is’ in Melbourne in August 2015, was created by the artist Paul Robertson. He uses it to document the highlights of Bowie’s career. I have also seen a similar concept for Pink Floyd on-line. It goes to show that periodic tables can pop up anywhere! Source: bowiewonderworld.com. This entry was posted in Australia, Books & reviews, Europe, Japan, Performing arts, Popular culture, Story telling, USA, Visual Arts and tagged Apps, Chemistry, Japan, Periodic table, Russia, the elements. Bookmark the permalink. It IS rather confusing to have these two groups both referred to as ‘the elements’. They are of course both deserving of the title, considering their equal status as ‘the building blocks of life’. Hopefully you don’t have to spend too much time explaining the difference! The amount of explanation required depends on the audience, as you would imagine. Your point that both groups of ‘the elements’ should have equal status is spot on. One of the aims of this blog is to help achieve this. I am in awe of the research you do for your blogs Jann, I just sit down and go for it. Have you seen the video of the elements dancing and the ones that do not get on with each other. Its a very humorous way of looking at the elements. I will source it for you and pm it to you. As always another insightful lesson from the Queen of the elements, Yay!! Thanks! All of that training and experience as a research scientist has proved useful for creating blog posts as well. ‘Going for it’ has a lot to go for it though. I’m aiming to sprinkle in a few posts in that vein as the blog develops. Definitely interested in the dancing element video. Thanks again.